The shoulder bears the brunt of a lot of work even in day to day activity. When something goes wrong, it can dramatically impact a person’s quality of life. The joint itself is quite complex with a wide range of motion and that ability can become compromised due to overuse, injury, or age. The goal of the chiropractor is to keep the shoulder moving naturally and ensuring that it is pain free. Frozen shoulder syndrome is one common condition that affects the shoulder, limiting mobility and causing pain. Chiropractic is an effective treatment that helps patients regain range of motion and decrease or eliminate their pain. Frozen shoulder, or adhesive capsulitis, is characterized by pain, stiffness, and limited range of motion of the shoulder joint. It can occur as a result of overuse or after an injury, but can also be caused by diabetes or other diseases or even stroke. It happens when the tissues that surround the joint become stiff and scar tissue begins to form in the area. Shoulder movements become painful and difficult. It typically has a gradual onset, then goes away just as slowly. It can take a year or longer for the condition to subside. There are three stages of frozen shoulder and from onset to resolution. It develops gradually and subsides just as slowly with each stage lasting several months. Stage 1 – Freezing Stage – The shoulder experiences pain during movement and the range of motion begins to decrease. Stage 2 – Frozen Stage – The shoulder is stiffer but the pain may begin to decrease. However, using becomes increasingly difficult. Stage 3 – Thawing Stage – The shoulder begins to “loosen” and the range of motion begins to return. Some patients may experience worsening pain at night which can lead to sleep problems. Frozen shoulder often develops when the patient ceases normal use of the joint due to injury, pain, or a chronic health condition. There is no single cause of frozen shoulder; it can be caused by any problem involving the shoulder that prevents the patient from maintaining full range of motion. It can also happen when the capsule that encases the connective tissue of the shoulder becomes thick and tight. The movement of the shoulder joint is restricted, impacting its ability to move. People who are 40 and older tend to be more at risk for frozen shoulder, and it occurs more often in women. 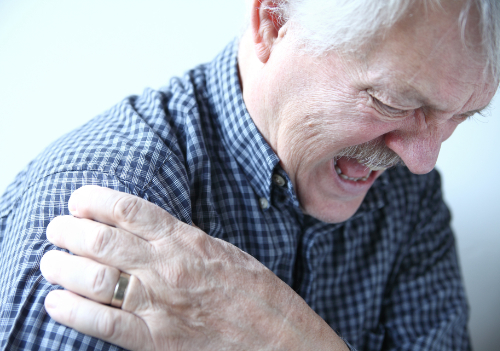 How can chiropractic help frozen shoulder? The primary treatment for frozen shoulder involves pain management and preserving the shoulder’s range of motion. Over the counter pain relievers like NSAIDs and aspirin are often the first line of treatment. Physical therapy may also be used. In situations where the symptoms persist, more aggressive treatment may be necessary. Doctors may recommend invasive remedies such as surgery and steroid injections. However, chiropractic can treat the condition from onset through resolution. Even in instances where the symptoms persist, chiropractic can still be very effective. In fact, it can be as effective as more aggressive measures without drugs or invasive procedures. Regular chiropractic care can help return range of motion to the shoulder and return the patient’s quality of life.